Your Mission of Docking with the NanoComputer Dream Team has Successfully Been Accomplished! Congratulations and Welcome! Browse around and then join in our quest and make History with us! You can also join in on the Global Nanotechnology VideoMedia Initiative which is providing the World with quality informative video clips and Video Live Conferences. Do your part now and secure your place in History! You are about to experience a totally new world. So prepare your consciousness to expand its awareness of the implications that Nanotechnology & NanoComputers will have on Planet Earth and beyond. It has always been a website where the exchange of ideas are honored and appreciated, welcoming the scientists and novice alike, as well as the public surfing for new information and the students looking for direction. During the past two years the Officers of the Corporation have been focused on developing many education and information projects while observing the quantum growth of this field. The last few months have brought daily news articles concerning new businesses, alliances and Initiatives around the world. Most of the news releases are aimed at the people already involved in Nano. The actual public domain does not have a forum that explains the developments, nor the reason behind the research. As a group we have decided to move our efforts forward with viable solutions to the many areas of NanoTechnology, NanoScience and NanoEducation that aligns with our mandate to provide a public forum with public domain access. 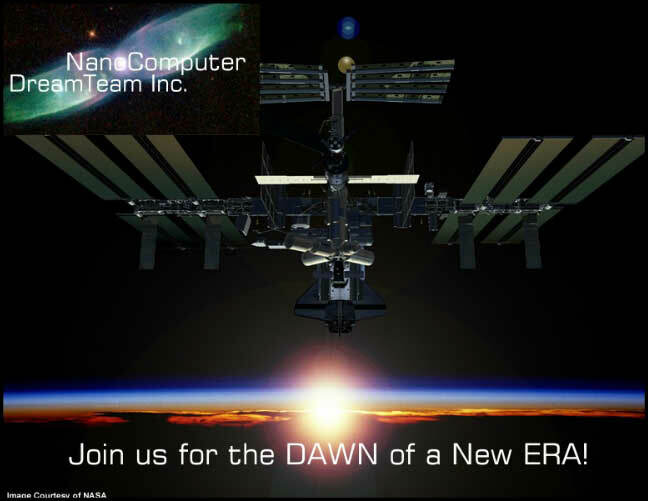 Browse the site and Join us for the Dawning of the New ERA! The NanoComputer Dream Team is also involved with the Video Media initiative to get all of the Nanotechnology field to start sharing Nano related video's, graphics and text to expose to the world for educational and awareness informational purposes. Never before has the public been more in need of seeing what Nanotechnology is all about and how it will impact their lives and our future. You are welcome to see a short video clip which will show you what is in store for our future.